We're ready to give up the "most hideous .30 cal brake" title! Even though the mount on the old 30BA was rock solid, everyone knew it was ugly. So we redesigned it. The new CB-series brake features a four-port, two-chamber design that is up to 40% more efficient than the old 30BA brake when used alone. We were able to reduce the maximum outer diameter of the shoulder surface while increasing the overall conical shoulder area to increase lockup strength. This smaller brake looks great on AR pattern rifles and 6.5mm, 7mm, and .30 caliber precision rifles. This new 30CB series replaces the 30BA series. The 30BA and 30BAS are discontinued as of this announcement. We will continue to support 30BA-series customers. 30BA brakes will remain for sale. 30BA and 30BAS suppressors may still be ordered on a special-order basis for customers already invested in the 30BA system. A CB series flash hider in .223 and .30 calibers versions will be available for ordering 6-8 weeks following this announcement. A “BA to CB” series adapter to permit use of a BA series suppressor on the new CB brake is in the works. In addition, we recently “quietly” released a revision to the 223P-1 called the 223P-2. This revision provides incremental improvements to suppression, strength, and durability of the 223P line. The new 223CB is the CB-series version of the 223P-2. The new 223P-2 and 223CB should give any .223 caliber suppressor on the market a run for its money when compared on the sound level meter. CB series suppressors, brakes, and external thread protectors may be ordered immediately and will be available for shipment following normal production and ATF Form delays. Please contact your local TBAC dealer to order. If you have questions about these new products, or support of old products, please email us or give us a call! Very interesting... was just about to buy another brake for my 30 BA. Any estimated time frame on the BA to CB conversion? If we are talking several months I will likely just get another BA, but if we are talking within the next month or two I might be willing to try one out. We're looking at 4-6 weeks minimum on the first brake availability. BA/CB adapters should be available around the same time. Thanks for the info Zak, the new products sound like they will be great for the next evolution of the product. So I just went and ordered a 30 BA. Should I still expect that in stock products will be supported? I wish I had known this would be coming out as I would have waited an extra couple weeks. We will continue to support the 30BA series. 30BA brakes will remain for sale. 30BA and 30BAS suppressors may still be ordered on a special-order basis for customers already invested in the 30BA system. Sounds good. Thank you. I already have the 30 BA brake on my rifle and was thinking that damn thing was huge. I may just order one of the new suppressors and get the new brake. Looks like another winning combo from TBAC and Zak. Just keeps getting better each year. Thanks for for great work, TBAC. How will this work with the 338BA and which 30 cal suppressor do you recommend someone to buy that already has a 338BA? "A “BA to CB” series adapter to permit use of a BA series suppressor on the new CB brake is in the works." Do you recommend me buying a 30BA suppressor and the old mounts or can I buy the new CB suppressor and mounts and stull use my 338BA suppressor on the CB/BA adapters? Edit. I obviously would have been running all single chamber BA brakes on all 30 cal. rifles. What is the diameter of the new CB brake? I'm trying to gauge just how much more compact these will be compared to the BA brake which is about 1.5". Could you possibly post a side by side photo? I couldn't find any specs on the website. And if I decided to swap out all of my BA brakes for CB brakes, would I have to buy an adapter for each brake to use my BA Can? Or could I buy one adapter and permanently attach it to the BA Can? If I missed the specs somewhere, I apologize. I haven't had my 2nd cup of coffee and morning turd, so I'm not yet on my A game. Zak, you just hit a home run, this is a brake I can live with. The 338BA is not directly compatible with the new 30CB brakes. You could use one of the CB/BA series adapters that we're working on, since something that fits into the 30BA can will fit into the 338BA can. As for what .30 cal can to get, if you don't mind the old 30BA brake and want true direct interchangeability between which can goes on which gun, get the 30BA. This is the exact reason we're continuing to build 30BA/BAS's for existing BA series customers. But what we found is that most people who used 338BA's on a variety of rifles AND had .30 cal cans, didn't use more than 1 of either their 338 or 30 cal can on any given rifle in the collection-- but your scenario about range vs. hunting makes sense. top to bottom flats: 0.940"
top to bottom flats: 0.806"
The intent is to put one into the BA suppressor and leave it there. Will the 338 line be going CB as well in the future? No, a "compact" brake would not give the braking required on a .338. The 338BA brake is proportioned right and is very effective on 338LM. 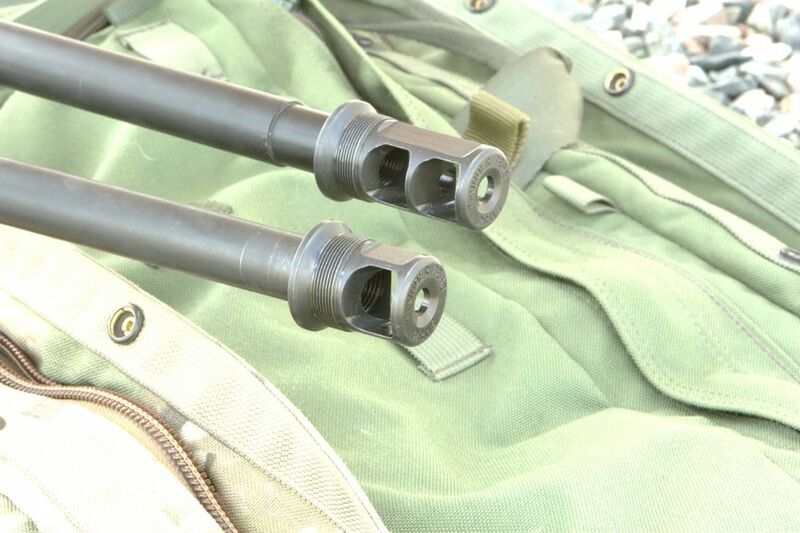 Any foreseeable changes to the 338BA brakes would not affect interoperability with 338BA suppressors. It looks like the 30CB9 is a little heavier than the 30BA (only 0.4 ounces nothing huge). Any added durability in the newer 30CB models? Sorry to nit pick. Just trying to make a quick decision to buy a 30BA or wait for the newer model. The suppressor is a fraction of an ounce heavier but the CB brake is over an ounce lighter than the BA brake, so the combination is a little lighter with the CB. Have you designed a thread protector for the new brakes yet? We'll have a thread protector ready about the same time the first batch of production brakes are done. huh. i actually liked the old brake and will continue to use it, i have one sitting here waiting to be attached to a 16" AR-10 build that will wear the 30BA. I do understand your forward move in this line though, maybe ill look into one of the 223CBs. The 30BA stuff can still be ordered so "If you like your 30BA you can keep it" (and we actually mean it). Decided to wait and go CB. I'm digging the extra brake chamber. This should help the blast baffle on anyone running their semi-autos hard. An extra piece of replaceable metal is always a nice thing to have to help reduce blast baffle damage. I'll just keep the 338BA for magnum rounds (300 RUM and up) and take the weight hit while on hunts. Now get to work Zak and stop wasting time answering our questions. I want these available and transferring by summer! What is the length added by the brake; can it be pinned to a 14.5" barrel to make it 16"+? Also, does the compact brake resolve the issues with mounting your suppressors to a barrel with a small shoulder like the SCAR 17? The normal brake will add just over 1.13" (ie plus the final peel washer thickness) if the muzzle threads are cut to our normal spec. We will have a version available that will bring a 14.5" to 16". A shoulder is still required for mounting. Those specs do not change. There has to be something to hold the brake square on the barrel and having no shoulder like the SCAR is a bad setup for suppressor mounting - at least one where you do not want movement. We may look into a brake specifically for the SCAR to solve this problem but we've had a relatively small number of inquiries about it. Zak, I'm assuming your "longer version" wouldn't work with the suppressor due to added length? No, it will. The back will just be longer. Well I'll say that looks pretty darn good to me! I love my TBAC cans and so do my customers. I like that you are making an adapter for the BA series cans so they have the ability to utilize the new CB brakes. Thank you for leaving a flat shoulder for getting a wrench in there. By the looks of it I should be able to use this on my 338BA & my 300 RUM for range trips where I want more sound/recoil reduction and than use the 30CB9 for hunting. I was worried the adapter would be more of a permanent modification. Talked with Amanda today and got in line for a FDE 30CB9! Alright, so I admit to being a little slow... but it was stated earlier in the thread that the intent for the BA-to-CB adapters is that an adapter gets installed into the BA can and left in place. Does this also apply to the 338BA can on a 30CB brake? If so, is it possible to mount a 338BA can on a 338BA brake with the BA-to-CB adapter in place (in the suppressor)? Or does the adapter need to first be removed? I have a 338BA can in jail, and have always intended to use it on sub-caliber hosts (as well as .338LM). I certainly find the new CB brake more visually appealing (and functionally appealing with the additional effectiveness) compared to the 30BA brake, and would like to use it on my sub-caliber hosts... just trying to figure out the adapter situation for moving the can from a 30CB-braked host to a 338BA-braked host. Does this also apply to the 338BA can on a 30CB brake? You can put the CB/BA adapter in a 338BA if you want to use it only on the new small CB brakes. If so, is it possible to mount a 338BA can on a 338BA brake with the BA-to-CB adapter in place (in the suppressor)? Or does the adapter need to first be removed? No. The opening in the back of the can is much smaller for the new CB brake. Or does the adapter need to first be removed? Yes, you would have to remove it. Our recommendation for installation is going to be to "semi permanently" install the adapter inside the BA can using loctite. Otherwise the adapter is likely to stay on the brake upon removal of the suppressor. For people in your situation who want to use a 338BA on 6.5's, 7's, .30's, and .338's, the best solution would be to keep using the 30BA and/or 338BA brakes. In the coming weeks we are going to be announcing the pricing of the CB/BA adapters and also the details of a "brake upgrade" program. Zak- that's what I suspected... I appreciate your response. BTW- I think it's friggin' AWESOME that you're on here and so available to the community. I first became aware of your work a few years ago when I was looking into the 6.5mm medium format cartridges and ran across your comparison of the Creedmoor, .260 Rem, and 6.5x47 Lapua. There was a lot of good info in that article, and there's a lot of good info that you continue to provide here. Thanks! So with a pinned/welded brake a 30CB5 will only add 3.5" to the platform? That pretty much eliminates any reason to buy a SDN-6 or a 7.62 Mini. Unfortunately it won't work quite that way. On the CB series of brakes, the distance from the seating shoulder on the brake to the end of the brake is constant due to how it fits into the rear end of the can. 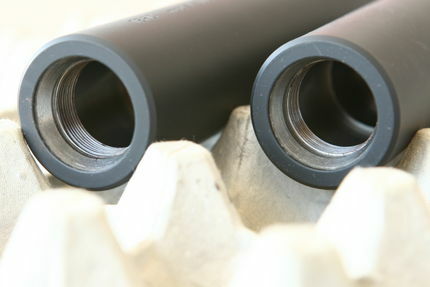 We can't just jam more brake length into the suppressor and have it work the same. Here are some rough numbers. They would be plus or minus the thickness of a peel washer and depend on the accuracy of the muzzle specs. The overall length of the CB brake pictured in the top post is about 1.72". For a regular CB mount the rear of the can is flush with the rear of the CB brake. 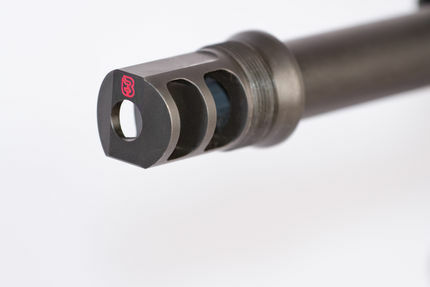 The OAL added to a barrel would normally be "muzzle length" - 0.6 + "length of can", or the length with the muzzle brake mounted minus 1.72 plus "length of can". For a muzzle device to bring a 14.5" to 16", it needs to be at least 2.1" long, a little longer to accommodate threads longer than 0.60 (which is not too uncommon on AR-10 pattern rifles). This is sort of off the top of my head so definitely wait for final measurements before making a decision. The 30CB5 and 30PSS are really designed for subsonic .300 blackout. They will be pretty loud on a full power cartridge. Thank you for the #'s, very helpful. That was pretty much my assumption, primary host will be a 300BLK and I have boxes of subs in the closet. The 30CB5 will serve to take the edge off of 556 until I can get the funds together for a larger can. Bump for any updates on ETA or some more sneak peeks of soon to be done cans. I placed an order directly through TB for a CB9 on May 12th. I was quoted 6 weeks, and was wondering if that is still the current time frame or if there has been any delays. Thanks Zak! Love my 3 BA suppressors, but these do appear to be a cosmetic improvement. Don't feel that further recoil reduction over the 3 I have is really necessary. Thanks TBAC for all your products, customer service and general support for this sport! Wow these look really nice! Looks like I will be going this direction for my next can. Love it! I know I've heard that somewhere before. Thank you for all the information Zak, this is great news as I am still waiting for my 30BA that I bought last year but had since decided I might have gone the wrong route as I didn't really like the "look" of the big BA brake especially on my hunting rifles. Now, with the ability to use an adapter with my existing 30BA can (once I get it) and to be able to use the CB brakes I think that is going to be a great solution. A couple of questions if I may. Will the CB-BA adapter use the same steel as the CB brake itself? Which loctite do you recommend for the adapter and the can? Will you be letting us know about the Trade-in program for existing BA brakes to the CB brakes on this thread or elsewhere? I would like to get in on that program asap, thank you. The CB/BA adapters is made of 17-4 the same as the brakes. It will be loctited into the can. We'll have instructions that ship with them. The first batch of CB brakes should be available in the next few weeks. The rest of the info on trading up will be available at that time. Had noticed a shooter at our local practical/tactical steel matches with a 2-chamber TBAC brake on his DTA 308 bbl, and am assuming it was the 338 brake/mount. Will have to ask him at the next match, as the appearance of his brake is nearly identical to the new CB brakes I'm seeing in this thread & the TBAC website. Whatever - it does look more effective and 'sleeker' than my old BA brakes. I'd like to change out the four BA brake/mounts for the new CB & adaptor, and not just for appearance sake - am hoping the new brake will have enough added effectiveness to make it easier to spot for myself on the closer targets during matches. Zak - have been shooting a M700 custom in 6x47 Lapua with & w/o my 30BA attached. While I've never seen any decrease in accuracy with the 30BA on the other three bbls I shoot it with, this is the first time I've seen an actual increase in accuracy (decrease in group size) with a can of any brand attached to any bbl I own. Outstanding! It was probably the 338BA brake. It has two chambers. Had noticed a shooter at our local practical/tactical steel matches with a 2-chamber TBAC brake on his DTA 308 bbl, and am assuming it was the 338 brake/mount. I think that is DTA SRS qd brake...I just sent him a text to ask him. I thought it was a TBAC brake as well, but I'm pretty sure he doesn't have a suppressor or any immediate plans to buy one. ETA: I confirmed with him it is a 338BA brake.